Whatever show you want, whenever you want it! 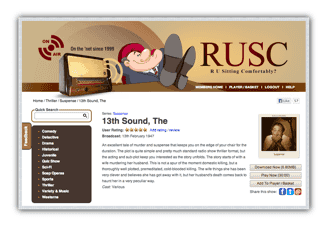 Established in 1999, the www.rusc.com members' site is jam packed full of everything old time radio related. In the years since it first saw the light of day it has grown into being the largest old-time radio site on the Internet. With over 50,000 pages of content covering everything from editorial through to individual show reviews, it is understandable why some people refer to it as the Wikipedia of Old-Time Radio! Here’s just a brief glimpse of some of the things you’ll find on the site. Over 35,000 old time radio shows to download or stream. Short reviews of every show to help you find shows you know you’ll enjoy. Ability to set-up your own playlist so you can enjoy uninterrupted listening whilst doing other things (great for doing the chores or whilst you’re at work - boss permitting). Enjoy old-time radio shows throughout your house with the wonderful Sonos® wireless HiFi system and RUSC Old Time Radio. Themed streaming radio channels for you to just sit back and enjoy (detective, comedy, music, etc). Old-time radio quizzes to test your knowledge of the shows and stars of the 1930s, 40s and 50s. Top 20 charts covering every genre, series and show so you can get great ideas for new things to listen to. Easy sharing of shows so if you find a show you know your friend would like you can share it with just a click of your mouse, and they don’t even need to be a member to listen to. Comments and rating for every series and show so you can add your own rating and review for anything you listen to. RUSC members also have access to RUSC mobile for listening on-the-move! "Woweee!!! I felt like I struck a gold mine when I found your website yesterday. I subscribed to RUSC and can hardly pry myself away from your radio shows. I work on the computer out of my home and I love to listen to these shows while I work. Thanks, Ned. Again, I say: Woweee -- I love these!" 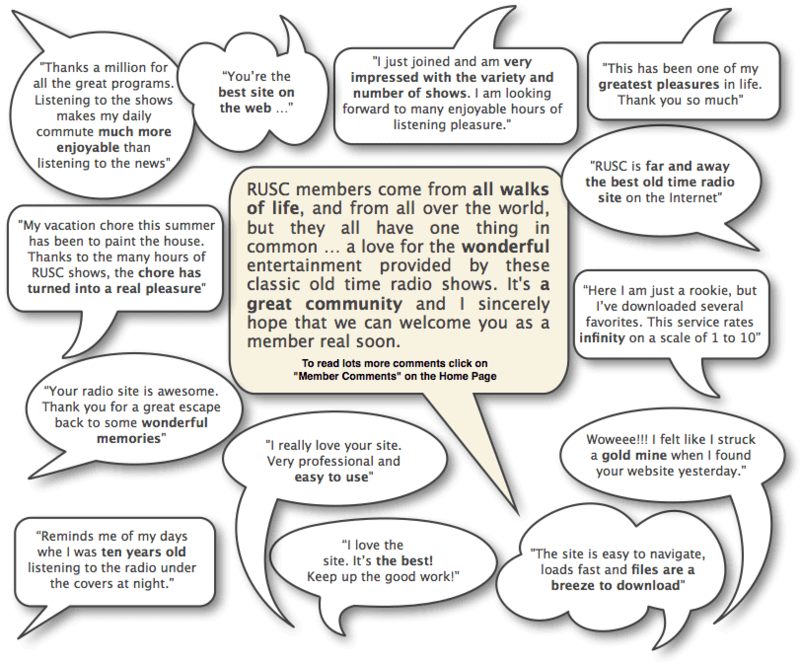 There are many reasons why our members truly enjoy RUSC. For some, it is the amazing variety of shows available - many of which are hard-to-find anywhere on the Web - but on RUSC it's a cinch with our online search. For others, it's the ease of use, the daily updates, the superb sound quality or the one-click downloading of shows to your PC or Mac. RUSC members also have access to RUSC mobile for listening on-the-move, regular editorial updates, RUSC Radio Stations (which plays through a gigantic list of old time radio shows in whatever genre you select), fun crosswords and quizzes, videos, and not to mention that all of the shows include heaps of detail, such as running time, size, stars and broadcast information. 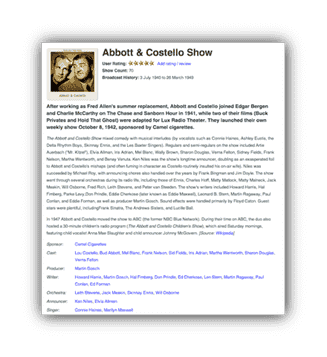 We wanted to build a website with the best compilation of old-time radio shows available anywhere, where enthusiasts like ourselves could stop by anytime -- day or night, 24/7 -- and enjoy listening to as many of their favorite old-time radio shows as they want. 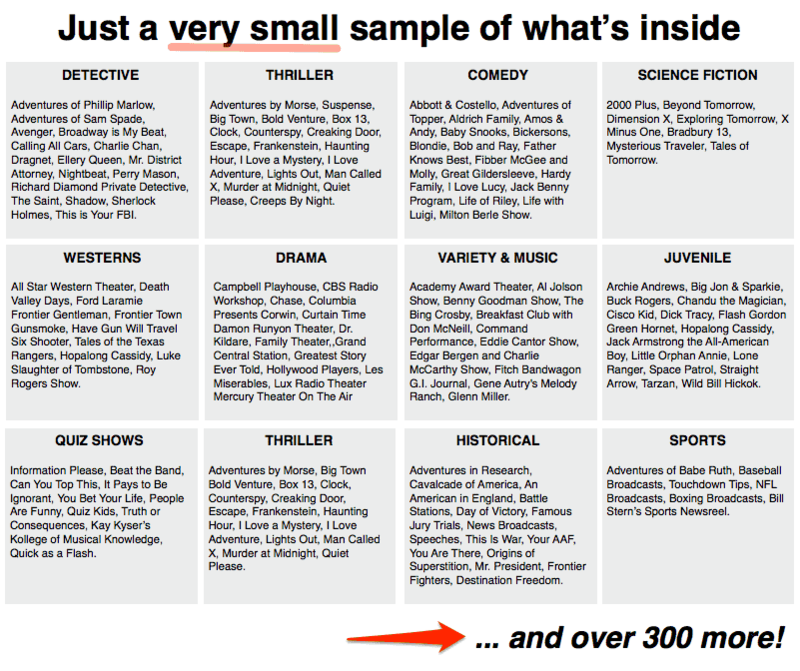 So we called our website RU Sitting Comfortably (RUSC) and started building what many have called the most impressive library of old radio shows in 10 categories -- comedy, drama, detective, science fiction, thrillers, westerns, quiz shows, music/variety, juvenile, and miscellaneous. While I continually expanded the content of RUSC, my wife, Joy, cheerfully took charge of answering many of the e-mails from our growing number of members. She answered questions, helped those who were not familiar with downloading the shows as MP3 files or other technical aspects, and showed them how they could get the most enjoyment out of their RUSC membership. There wasn't a day that went by that Joy didn't put a smile on the faces of our members. Before long, we had over 20,000 of the best old time radio shows in the RUSC library -- and more happy members than we could count. But it didn't stop there. To this day, we continue to add more shows to the library every single day of the year (including weekends and holidays) -- except Wednesdays when Joy and I take a break. As a result, numerous letters and e-mails started pouring in from our satisfied members. All kinds of unsolicited testimonials and rave reviews jammed our e-mail box from people all over the country -- calling our site "the best website" for old-time radio shows -- "a gold mine" that brings "many hours of pleasure." Almost everyday, people tell us that one of the main reasons they like being members of RUSC is because they feel comfortable knowing that Joy and I are behind this website -- 2 real people who are just like them, who share their love of old-time radio shows, and who are willing to go the extra mile to provide them with as much enjoyment from these shows as possible. ... so much so that some have even suggested that we rename our site "Ned and Joy's Old-Time Radio Family." Hmmm... that has a nice ring to it, don't you think? After all, there truly is a sense of family and camaraderie here at RUSC -- if I might say so myself! Click here to read other rave reviews. Access to All the Old Radio Shows You Want 24/7 -- There's no need to pay a considerable amount of money for the privilege of listening to old-time-radio shows (typically $5.00 to $34.98 or more per CD). RUSC is a not-for-profit, family-run website -- and there is never any charge for listening to the shows themselves. Any money we receive in membership fees goes towards covering hardware costs, server space, bandwidth, general administration, and maintenance of the site. "I couldn't find a better deal than this if I tried"
"I feel like a kid in a candy store! At RUSC, I can download and listen toallof the old-time-radio shows in RUSC's amazing online library containing thousands of shows. I don't have to waste my money buying old-time-radio CDs. All the old-time-radio shows are made available as a benefit to members of RUSC for one low monthly fee that comes to just 25 cents a day! I couldn't find a better deal than this if I tried!" Listen On The Go -- That's right! As a member of RUSC, you have access to RUSC Mobile, so you can listen to any old time radio shows of your choice, when you're on the move! Good Sound Quality -- A huge selection of old-time-radio shows means absolutely nothing if the shows sound tinny, scratchy or full of static. We make sure that the shows that are available at RUSC have good audio quality in crystal clear MP3 for your listening pleasure. "I'm truly amazed at the quality of sound ..."
"I consider myself fortunate in being able to bring up your old-time radio shows on the computer. It takes me back a long time ago when I was a youngster when some of these shows were actually being broadcast over the radio...I’m truly amazed at the quality of sound that the different shows have... the voices are in totally good shape. I’m glad to recommend this to anybody who’s willing to listen." Ned's Top 10 -- Whenever you enter the RUSC Member's Area, you'll find a column on the right-hand panel titled "Ned's Top 10." I put together and constantly update this ever-changing list of the old-time-radio shows that have been downloaded most frequently over the past month. It's a good way to find out what other members are enjoying -- so that you can enjoy them for yourself as well. Powerful Playlist -- From anywhere on the site, you can add a show to your basket, and from the basket, you can either download all of those shows, or queue them up as a Playlist to play online straight away. You can play, pause, fast forward, rewind, reorder, adjust the volume - everything! The playlist even remembers everything for the next time you log in! the star of the show or the series itself if you wish. Series Description -- If you want to find out more about any particular series you can click on the appropriate link and you'll arrive at the Series Description page. Sometimes it features just a brief overview, other times it is a mini-essay including information such as when the show was first broadcast and when the final broadcast went out, who sponsored it, the cast members and announcers, writers, theme tune and a potted-history of the show. This information can be a useful background resource and makes listening to these wonderful shows even more pleasurable. Power Search Function -- If you have favorite shows that you want to find in our extensive library of shows, the Member's Area has a Power Search function that enables you to search by show title, series name, broadcast date, name of star or keyword. This lets you get to the shows you want instantly! Relevant Editorial Articles Written by Yours Truly -- When you enter the RUSC Member's Area, in addition to seeing a listing of the shows that I've added to the library over the past few days, you'll also see an editorial article that I've written. I post a new one frequently during the week. These articles include stories sent in by RUSC members sharing new ways to enjoy the old-time-radio shows, relevant quizzes, fascinating facts about the radio stars and shows, special tributes, commemorations, well wishes and other timely information. Our members absolutely love this because they say the editorials brighten their day, teach them something new, and make them feel right at home in our old-time-radio family! Old-time Resources -- If you really want to stroll down memory lane to the hilt, there are interesting resources in the Member's Area -- such as recommended old-time-radio books, old-time advertising, and even old-time radio commercials for your enjoyment. just let us know and you'll get a full refund. Therefore, you can join with complete confidence -- and absolutely no risk on your part. Access to over 35,000 classic radio shows in the RUSC library that we personally hand-picked for your enjoyment. More shows added every day of the year (including weekends and holidays) except Wednesdays when we take a break. Access to the RUSC Mobile website, so that you can listen on the move! Ability to easily download shows to your computer to listen to whenever you like. RUSC remembers exactly what you've listened to, or downloaded, so you don't have to! Regular editorial articles about the stars, the shows and more. Useful tips and tricks to help you get the most enjoyment possible. Membership of RUSC costs only $7.50 per month! All the shows available on the RUSC website are for the enjoyment of RUSC members. There is absolutely no charge for the privilege of listening to the shows themselves. Your $7.50 monthly membership fee is simply a contribution towards hardware costs, server space, bandwidth, general administration, and maintenance of the site. Therefore, for just 25 cents a day -- less than the price of a pack of gum -- you'll enjoy all the member benefits I mentioned above and get the best bang that you've ever gotten from your entertainment dollar! "My entertainment dollar has never brought me so much for so little." It's heartfelt letters like these that makes all the hard work we put into this website worthwhile. If we're indeed making a lot of people very happy, and changing the world in a positive way, we feel we've done our job well -- and that means the world to both Joy and me. We invite you to let the old-time-radio shows here at RUSC engage you, thrill you, touch your heart, make you cry, make you laugh -- and best of all, make you free. Joy and I look forward to welcoming you to our growing family!